Children’s Mental Health Week kicks off today and with it comes the myriad of articles and press releases seeking to address the issues of child mental health. And yes, kids are under more pressure now than they ever have been. I cannot even begin to count the number of times I have expressed relief at not having to deal with so many of the issues that today’s children face. Growing up is tough enough without the pressures of the internet, social media and mobile phones. Certainly, I know I wouldn’t have been a sensible enough kid to deal with it at all aptly, and I had enough of playground despots during my real life school breaktimes without the worry of having to deal with them relentlessly in the online world too. When I was a child (oh, back in my day! ), we had the Richmond Test to sit through. I quite enjoyed them and personally didn’t find them worrying or onerous. Then again, we didn’t seem to be placed under the same kind of pressure or stress that pupils today are. Education for today’s children seems to be very different. Let me be clear; I do not have an issue with schools. Teachers are amazing and do an incredible job of trying to balance the welfare of the children within the constraints of a system that often doesn’t listen to the ones on the frontline that know what is needed most: the teachers themselves. This results in too-much-to do-in-too-little-time-and-the-kids-suffer-and-the-children-suffer-and-everyone-is-frustrated-because-everything-needs-to-be-done-and-nothing-seems-to-be-working-so-what-more-can-we-do-anyway…. ? Whilst I do not have an issue with schools, I do not believe the education system will ever achieve a one-size-fits-all solution that will suit every child in every way. Every child is unique and has different strengths and different weaknesses. Every child has a talent. Every child has a skill. Every child is good at something – even if it’s not what a curriculum states it should be. 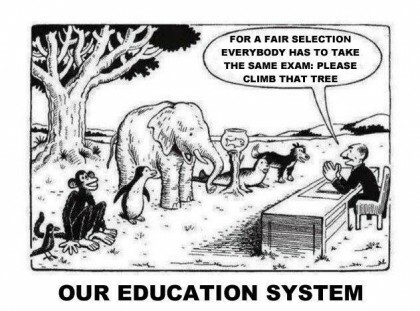 Unfortunately, we have an education system that tells a child that if their talent or skill does not fit their academic requirements and standards, they must set it aside and focus on meeting the requirements and standards that it dictates must be met. A child will believe that what they can do doesn’t matter. What they love to do won’t benefit them. That their strengths are actually their weaknesses. Simply put, there isn’t enough time for it all. A school day is short but it is also rigid. Home education is a viable and effective option for many children who have other interests and pursuits to follow, which a regular school day would not allow time for or might even discourage. This article suggests how more time for play can reduce the rise of mental health issues that children today experience, citing how ‘…they have been dangerously eroded by closely specified curricula, performance-focused education systems and the decimation of the youth service‘. No child should ever think that their own skills and talents are something to be hidden away in order to meet a general standard or grade that is set by someone that does not even know them. I am not suggesting we stage an incumbant revolution against the education system. I do believe we need to offer our children less stress, less pressure, more balance and more flexibility, and home education is a good option to try to effectively try to achieve that balance. What is your opinion on this? I’d love to hear your thoughts so please do leave them in the comments below. *This post has been brought to you in association with online school InterHigh.